Dry Trout Flies mimic the fly in its adult stage. Dry trout flies generally look quite delicate and go from pale to black. Try to float the dry fly at the same speed as the water to imitate the most natural look to the fish. Using a fly floatant is a good idea to stop it getting water logged. 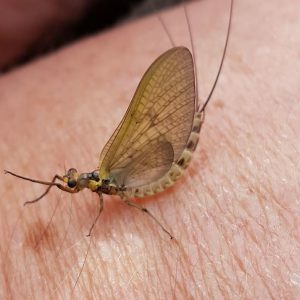 Trout will raise out of the water to take a dry fly, as they do not have eyelids remember they will not be keen to do this on a very sunny day, so stay fishing in the shade through the day when the sun is high. Summer evening fishing will produce the best results. Have a look at what flies are around. White moths are a common evening fly.